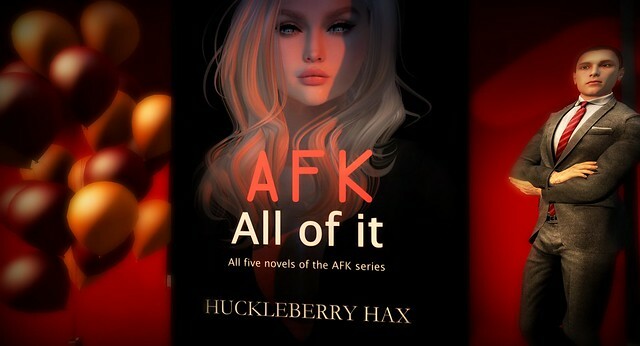 Two weeks ago, on 16 March, Secondlife Author Huckleberry Hax published his 5 detective novels in the AFK series combined into one, 740 page book. This publication marked the closure of his series and of course this was celebrated with a launchparty in Huck’s Stoshchuckles Bar in the Nancy Redgrave Building. Huck asked me to help him organising this event, just like we did in december for the launch of the 5th and last AFK novel – AFK, awaiting. The event was great, a lot of fun and dancing and it was lovely to see so many of Huck’s friends and fans coming together to party and listen to Huck reading one of the chapters from his book. I’ve read all five novels the past years and though I am sad this series has come to an end, it is understandable one has to move on at some point. Because I have read all the volumes on my iPad I thought it would be a good idea to have the complete works in a printed version. So I treated myself on the paperback of AFK, all of it and ordered it via Lulu.com last week and today it (finally!) arrived. As things go, of course I was home all week and today I was out of town for work. It was raining cats and dogs all day and the mailman thought it was a good idea to just leave it at my frontdoor….Argh! A suprise when I came home. But also a worrying one, seeing the package I waited for all week just casually lying there on my driveway, wet and slightly damaged! To my relief it wasn’t that bad, the book itself was tightly wrapped in plastic inside the wet carton, though there is a bit of damage at one of the corners. Oh well, I am delighted to have it and it looks amazing and shiny! It is a bit odd to hold a book in your hands with the name of a good Second Life friend on the cover, but also funny! Now I am hoping for nice weather soon, so I can sit outside on the deck and cuddle up with this book and some tea! 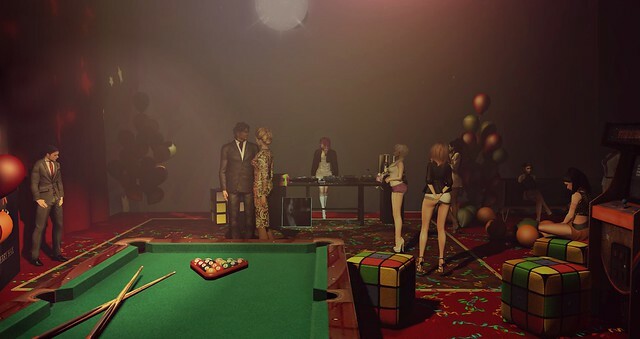 In the virtual world of Second Life®, Definitely Thursday is a metaverse detective. What starts off as a part-time job exposing cheating partners, however, becomes a hunt for real-life criminals as Thursday descends into the online world of murder, revenge and terrorism. I am not going to spill the story or plot, you can buy the book(s) in hardcover, paperback (like I did) or digital versions – for all the links please go to Huck’s post here, I assure you – if you love detective stories and Second Life, you will not regret it! Next Post 3 Flickr Photo Contests you should enter! I’m waiting for my paper copy to arrive. Can’t wait!